Thanks to a lot of kindness and support, my book, Heaven Up Here, won the Brodie award for best book-length memoir of 2011. I’m very proud of the book because I think it’s well-written and compelling. I’m honored to know that many of you feel the same way about it. Now I can say I’m an award-winning author. Thanks again, everyone! And if you haven’t read the book, what are you waiting for? Once again, The Church of Jesus Christ of Latter-day Saints is getting some negative press because, despite its earlier commitments, it continues to allow proxy ordinances for deceased Jewish victims of the Nazi Holocaust. This time, the names of famed Nazi-hunter Elie Wiesel’s parents were discovered in the database of Mormon proxy ordinances for the dead (called the International Genealogical Index, or IGI). In response, the church has issued an apology and announced that the person who had submitted the name has been indefinitely barred from participating in the name-submission process. But is this enough? It may help first of all to understand this uniquely Mormon belief and practice. The idea of being baptized by proxy for dead individuals comes from a verse in the New Testament: “Else what shall they do which are baptized for the dead, if the dead rise not at all? why are they then baptized for the dead?” (1 Corinthians 15:29). In 1841, Joseph Smith, the founder of the LDS church who Mormons believe was a prophet, claimed that God had instructed him to build a temple. Here Mormons would be able to perform sacred ordinances, including proxy baptisms for deceased ancestors: “For a baptismal font there is not upon the earth, that they, my saints, may be baptized for those who are dead— For this ordinance belongeth to my house, and cannot be acceptable to me, only in the days of your poverty, wherein ye are not able to build a house unto me” (Doctrine and Covenants 124:29-30). Then I would be immersed in the water (usually by bending my knees and having the priesthood holder lower my back into the water). Normally, Mormons do such baptisms for a number of people. A recorder seated near the font displays each name, and the person is baptized in fairly rapid succession for each deceased person. Baptisms are not the only proxy ordinances performed in LDS temples. Mormons believe that only those who have received the ordinances of the Holy Priesthood will be admitted into the highest levels of heaven. Accordingly, after a person is baptized, they must also go through an ordinance called an “endowment,” which is essentially an adaptation of Masonic ritual combined with religious imagery and specific covenants of obedience (it is in the ordinance of the endowment that Mormons receive their temple garments, which are sacred undergarments with Masonic symbols sewn into them). Also, Mormonism teaches that only those who are married “for time and eternity” will be exalted as gods (see Doctrine and Covenants 132). Thus, Mormons must be “sealed,” or married by priesthood authority in the temple. Because these ordinances require priesthood authority, Mormon males must be ordained into the priesthood to receive these ordinances. All of these rituals are performed by proxy for deceased persons. From that beginning, the church has over the years done extensive genealogical research all over the world so that members could perform proxy ordinances for every person on record. Individual members are encouraged to submit records for their ancestors using a computer program called TempleReady, which checks the submitted data against the information already in the church’s temple records (the IGI) to avoid duplication. These checks are done locally, such that if a name is successfully checked against TempleReady, the member can take the information on a disk or on paper directly to the temple. TempleReady is limited in its ability to check information because only records that are identical in every way are considered duplicated; thus, if any information is missing or misspelled, the name is approved, which leads to a great deal of duplication. When one looks at the data in the IGI, it’s obvious how widespread the duplication is and how few real checks there are. For example, church founder Joseph Smith’s name appears in the IGI numerous times, with each record differing only in detail, such as his birthplace, his date of birth, his parents’ names, and the number of his wives. My Williams family genealogy is a hopeless mess in the IGI because my great-grandfather is listed as having no children. Although church members are supposed to focus on deceased ancestors and are not supposed to submit names of those born within the last 95 years without a widow’s or child’s written permission, things often get out of hand. Zealous Mormons have done temple ordinances for deceased celebrities from Patsy Cline to Tupac Shakur; Karen Carpenter seems to have the celebrity record with 11 baptisms in such far-flung places as Salt Lake City, Washington, DC, and Mexico City. Clearly, there is little oversight of the process, as barely a year after his death, Johnny Cash was baptized in Atlanta and subsequently in São Paulo, Brazil; Boise, Idaho; Nauvoo, Illinois; Newport Beach, California; and Monticello, Utah. This is the same process by which names of Jewish Holocaust victims were submitted for church ordinances without family permission. After a non-Mormon reported the practice, the church issued an apology and pledged to work with Jewish groups to ensure that it would not happen again. Which brings us to this year, when the names of Elie Wiesel’s parents, both victims of the Nazis, were discovered in the IGI, meaning that Mormons had performed proxy ordinances for them. The church again apologized and restricted the responsible person’s access to TempleReady and the IGI. But it’s notable that, despite the church’s insistence that it has in place safeguards to avoid such embarrassing incidents, the names cleared TempleReady, the ordinances were performed, and only after the fact did a non-Mormon discover the problem. Some people are calling on Mitt Romney to pressure the church into ceasing this practice, but to my mind, this just illustrates how little has been done to ensure the proper use of the IGI. It shouldn’t be that hard to prevent duplication of names and, more importantly, inappropriate and unauthorized submission of names to the temple. Recently, I was asked, if Joseph Smith really did create the Book of Mormon, how on earth did he come up with a story of ancient civilizations who came across the sea from Jerusalem? The answer isn’t that difficult, and it has a lot of explanatory power. The Book of Mormon emerges from the mound-builder mythology of the early 1800s. Earthen mounds had been discovered in parts of the United States, which seemed to originate with a sophisticated ancient civilization. White Americans did not believe that Native Americans were capable of such sophistication, so legends began to emerge of a white, advanced civilization that had existed anciently in the Americas, but eventually the savage Indians had destroyed them. Ethan Smith’s “View of the Hebrews” and Spaulding’s manuscript are different takes on this legend, Smith suggesting that the lost civilization was founded by Hebrews, and Spaulding’s tale describing shipwrecked Romans. In the Finger Lakes region of New York where Joseph Smith grew up are a number of glacial drumlins, which are elongated hills formed by glacial movements. 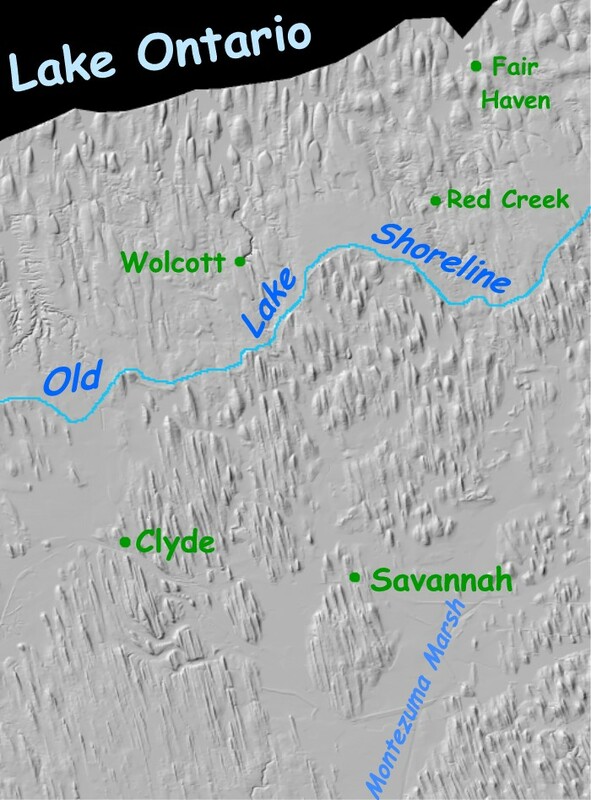 The following image from the US Geological Survey shows drumlins in Wayne County, New York, which are oriented northwest to southeast. Note that Palmyra is located in Wayne County. In Joseph Smith’s time, these glacial drumlins were believed to have been burial and other “mounds” built by the ancient mound builders. Thus, Joseph Smith in 1841 published articles describing the mound builders (based on Josiah Priest’s work) as supporting the Book of Mormon. If anything, Joseph Smith taught a hemispheric model, as the Doctrine and Covenants repeatedly refers to western Indian territory as the lands of the Lamanites. But the idea that Cumorah was not in New York does not originate with Joseph, either through revelation or personal opinion. On the contrary, Doctrine and Covenants 128:20 associates Cumorah with the revelation of the Book of Mormon; the verse makes no sense if Cumorah is in Guatemala. So, then, what are the reasons for shifting Cumorah to Central America? Mesoamerican civilizations provide the large populations and advanced cities that the Book of Mormon describes. New York-area Native Americans do not fit the model, as they were still largely hunter-gatherer societies, although some “mound builder” societies did show more advanced development. It would be easy to describe why Mesoamerica is not a good fit, as their technologies, culture, religion, and history are a very poor match for Nephites and Lamanites. See, for example, Mormon Mesoamerica for a discussion of the problems. Mound-builder myths are a much better fit for the Book of Mormon than are Mesoamerican theories (see Book of Mormon Evidence for more). You are currently browsing the Runtu's Rincón blog archives for February, 2012.